During a state visit to China by Saudi Arabia's King Salman bin Abdulaziz Al Saud from March 15 to March 18, the two countries signed deals worth as much as $65 billion, including a partnership agreement to manufacture drones, Reuters reported on March 16. In recent months, Saudi Arabia has frequently bought drones from China. According to a report in February by the Xinhua News Agency, China's unmanned aerial vehicle (UAV), called the Wing-Loong II, had the "biggest overseas purchase order in the history of Chinese foreign military sales" of unmanned aircraft system. Although Xinhua didn't disclose the name of the buyer, a report on defence-blog.com in March revealed that the Wing-Loong II was sold to Saudi Arabia. China's growing trade of drones with Saudi Arabia reflects the growing popularity of Chinese weapons, especially UAVs, on the global market, thanks to their comparatively low prices and technical advantages, a source from CASC, who did not want to be named, told the Global Times on Wednesday. The CASC person brought up the Rainbow UAV as an example of China's advanced drone technology. 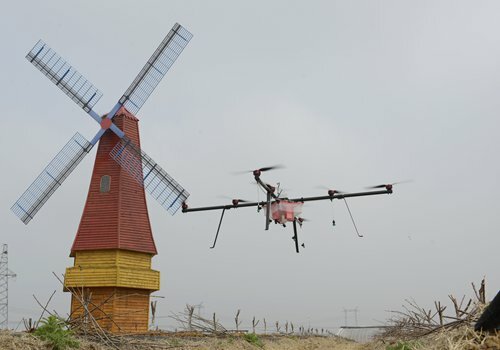 "Chinese UAVs' wonderful performance on Middle East battlefields such as in Pakistan may have caught Saudi Arabia's attention," said Zhou Rong, a senior research fellow at the Chongyang Institute for Financial Studies at Renmin University of China. Externally, the US, the biggest competitor to China's drone exports, has a "complicated, idiosyncratic, and unpredictable" process for exporting military technology, Kreps told the Global Times on Wednesday. Saudi Arabia's growing dealings with China come at a time when Chinese drones are gaining popularity on the international market. "The fact that they have not only bought drones, but also drone production lines shows Saudi Arabia's ambition to become a manufacturing center in the Middle East, as they turn from an affluent country to a developed country with assets and technologies," Zhou said. Li noted that buying a UAV production line is not a common practice, "but it's a smart decision because it can help Saudi Arabia narrow its gap with Iran's UAV manufacturing industry," Li said. "I guess Saudi Arabia has been attracted by the results of the 'One Belt and One Road' initiative and the China-Pakistan Economic Corridor," Zhou said.